More than 67,000 FFA members from across the U.S., representing all 50 states, Puerto Rico and the U.S. Virgin Islands, are expected to attend the 91st National FFA Convention & Expo in Indianapolis. Convention and expo events will take place in downtown Indianapolis and surrounding areas. 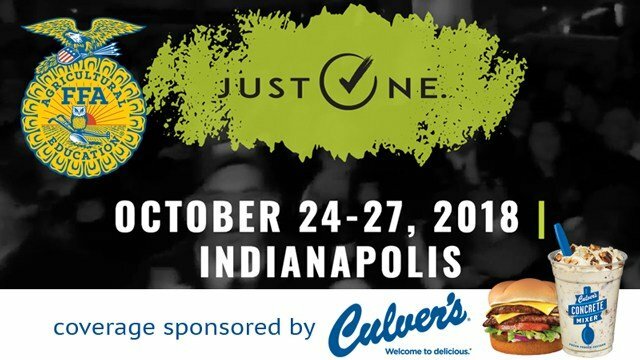 FFA members and advisors will meet in Bankers Life Fieldhouse, where eight of the nine general sessions will be held. At the Indiana Convention Center, members can explore the expo or expand their minds by attending a variety of workshops or participating in education and career success tours. This year, the chosen theme is “Just One,” in recognition of profound impact that singular individuals and events can make upon the world – one moment, one encounter, one opportunity is all it takes to radically change the course of our lives." Once again, RFD-TV will cover the convention with daily broadcasts of various sessions. Fans can watch right here on RFD-TV, on Country Club, on The Cowboy Channel, and can also listen on RURAL RADIO Channel 147 on SiriusXM. View our broadcast schedule HERE. Check back here stories, photos, video and more from the four-day event. Going to the convention? Stop by and see us at Booth #654!